From Rebecca Rajewski: My internship is with the DSA Marketing Office here on campus, located on the third floor of the Oglesby Student Union. Our office handles the internal marketing for the University. Some of our clients include the FSU Student Activities Center, the Askew Student Life Cinema, and the University Counseling Center, as well as independent recreational facilities within the Union such as Crenshaw Lanes. One of our most recent projects involves putting together the marketing materials for Haunted Harvest. 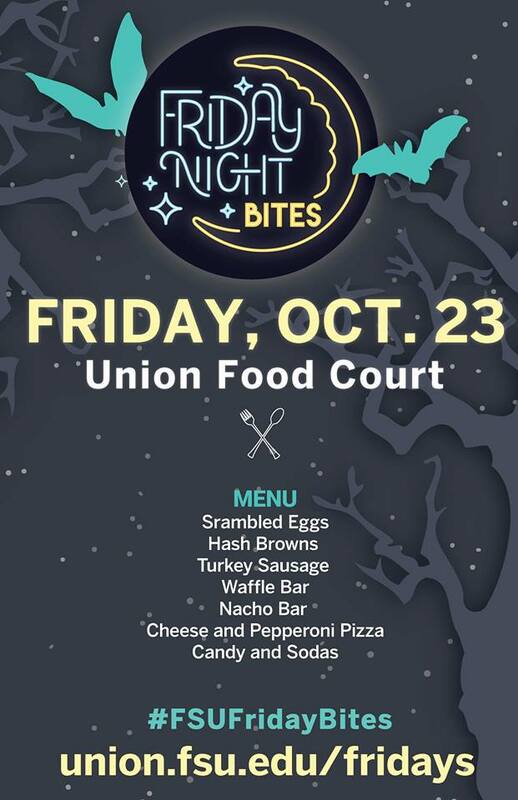 My assignment was to take our generic Fridays at the Union materials and create a version that reflected the Halloween inspired theme. Some of the challenges that I am facing currently stem from the fact that the office is an internal marketing service. This means that any official department on campus has access to our services without having to pay us directly; our revenue comes from the University itself. Since we are not paid on commission, clients can technically request and unlimited amount of proofs, changes, and revisions without any monetary consequences. This system does not encourage the client to be efficient in their planning or their edits. While we are happy to work with a client until they receive a satisfactory product, projects can sometimes take much longer than originally planned to complete. This kind of experience that I have received from the DSA Marketing Office is invaluable. It has given me an opportunity to gain real-world experience while still having a certain amount of supervision and guidance that won’t be available in a “real” job. Furthermore, my superiors at the office are also very generously helping me with my personal portfolio and brand. Learning along with my peers at the office is incredibly inspiring. We constantly show each other our progress and encourage one another to exceed our own expectations. I’m looking forward to developing my personal brand and portfolio within the next few months as well as continuing to gain experience in such a positive work environment.